The “Fast and Furious” franchise jumped the shark a long time ago. Now, it’s all about how high to jump with each successive outing. Don’t take that the wrong way. The new Furious 7 isn’t a bad movie, nor is the franchise running on fumes (engine metaphor alert!). Instead, the seventh installment embraces its ridiculous plots, logical hiccups, and lame jokes. They’re as integral to the franchise as Vin Diesel’s biceps. So is Furious 7 a great ride? Oh, yeah. The film arrives with a somber offscreen back story. 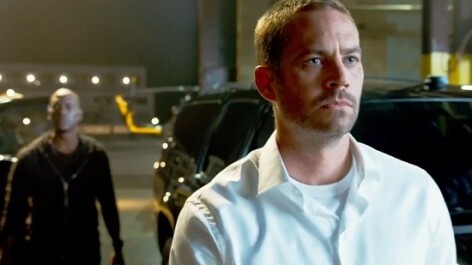 Franchise mainstay Paul Walker died in a car crash in 2013. His passing delayed the film’s production, which was roughly halfway complete at the time of his death. Thanks to existing footage, stand-ins (brothers Caleb and Cody Walker), and digital trickery, it’s as if he is still a part of the festivities. The movie opens with the brother of the beaten bad guy from the sixth film vowing revenge against our Furious family. It’s Jason Statham playing the avenging devil, so you know the stakes are sky-high. Statham’s Deckard Shaw first targets Hobbs (Dwayne Johnson), who joined the franchise in part 5 but is every bit a part of the team now. He’s monstrously muscular, seems impervious to pain, and cracks wise with alacrity. He’s overqualified. Shaw is just warming up, forcing Dom (Diesel) and the rest of the team to reassemble to save their own skins. Along the way, the team unites with Mr. Nobody (Kurt Russell), a shadowy government operative willing to help them take out Shaw—for a price. The “Furious” films began as an excuse to ogle scantily clad women and vicariously thrill to illegal car racing. Today, it’s a multiethnic cast hired for another round of, “can you top this?” stunts. Furious 7 tops them all. Director James Wan, the horror maestro behind Insidious and The Conjuring, honors the franchise particulars while producing even greater adrenaline rushes. That means we get cars jumping out of planes like metallic skydivers and lingering bikini shots Hugh Hefner might deem exploitative. You may need a spa session after enduring the film’s signature set piece, a roadway rescue for the ages. And then there’s the family element. It’s the most potent storytelling trick of the franchise now, the notion that this disparate group, from different nationalities and backgrounds, consider themselves a whole. They’ll sacrifice everything for the group or even a single member, no questions asked. The family element is ladled on like a Chipotle clerk applying sour cream to a burrito, but it registers all the same, giving the clanging dialogue and absurd stunts a soul. Perhaps that’s why the franchise gatekeepers handle Walker’s death with surprising delicacy. It’s not enough to see him save the day again and again. The sequel honors Walker’s contributions to the series as well as the imprint left by Brian, the kindhearted character he played in six of the seven films. Before then, we’re treated to a few franchise cameos and the kind of action that leaves audiences physically spent. Even by “Furious” standards some of the physical feats are absurd. When one character survives a calamitous ride down a mountain, the series threatens to collapse upon itself. If the heroes can survive certain death, then what’s the point? The movie won’t let those worries fester, and it’s on to the next chase, crash, and clumsily executed bonding session. One feels sympathy for actor Tyrese Gibson, a breezy screen presence given some the hokiest lines of the series. Chris “Ludacris” Bridges is allowed more dignity, but Jordana Brewster is reduced to a generic wife role. In between, we see some tender moments between Michelle Rodriguez’s Letty and Dom, as the former tries to piece together memories from her movie-friendly memory loss. Much has been made of the franchise’s ethnic diversity, especially in an age where Hollywood’s casting choices are often monochromatic. What’s particularly appealing is how the diverse cast goes about its business. They take responsibility for their actions and how they treat one another. They don’t complain or blame others for their woes. When in trouble, they double down on their efforts to get the job done. And they retain their senses of humor every step of the way. They truly represent America in a way the average MSNBC anchor might tut-tut. That’s simply part of the franchise’s formula for success. It’s all of the above plus those jaw-dropping stunts. The “Furious” films acknowledge that moviegoing in the 21s century is about the experience, not the storytelling. Leave the latter to those masterful cable dramas. Buying a ticket today means buckling up for a rollercoaster ride. And we may look back at the very first summer movie of 2015 and say Furious 7 gave us more bang for our buck than any other blockbuster of the year.